How to have a Profitable Internet Business in a 30 Day Window! Being able to decide what your work hours are. Want to knock off early one day? It’s your decision. Being able to live a life of INDEPENDENT WEALTH! And you’ve definitely come to the right place. I’m about to reveal to you literally the easiest and most proven way for anyone to make more money than they ever thought possible on the Internet! And, best of all, this plan will allow you to begin earning massive profits immediately and will have you succeed beyond your wildest dreams in just 30 days (or less)! Forrester Research predicts that online retailing will grow from $95.7 billion (in 2003) to $229 billion by 2008 and account for 10% of all retail sales. Currently, over $100 billion worth of goods is sold online! According to IDC, nearly one billion people, or about 15% of the world’s population, will use the Internet this year! There are numerous ways to attract hundreds or thousands of potential customers to your Internet business – for free! Thanks to “The 30 Day Internet Profit Plan” it has never been easier to get the expert advice and information you need to succeed! Hello, my name is Bob Bastian and thanks to the cutting-edge tips I reveal in my new audio e-book, “The 30 Day Internet Profit Plan” I can happily say that I am currently succeeding beyond my wildest dreams as an online business owner! Would you like to be saying the same thing just 30 short days from now? If so, I urge you to keep reading! Dream Is Becoming a Reality! Now I want to share my good fortune with you by providing you with all the tips, tricks, techniques and secrets that allowed me to achieve the success of my dreams. Well, after what I made last year, I’m feeling that urge pretty strongly right now! I guess you could say I’m doing this because I can afford to and because I wish someone would have done the same for me when I was first starting out. Things would have been so much easier and I wouldn’t have made so many costly mistakes! “The 30 Day Internet Profit Plan” audio ebook contains the exact, easy-to-follow, step-by-step instructions you need to know to establish and begin running your own profitable online business in just 30 days or less! How to develop a success mindset – you can have the best tools and strategies at your disposal, but if you have a poor attitude and mindset, those tools and strategies will not do you much good! How to start an Internet business from scratch – and succeed faster than you ever imagined possible! 10 common money and success myths – that old saying “the truth will set you free” could not be truer! How to effectively manage stress – and ensure that your body and mind are always functioning efficiently! How to “find your passion” – and ensure your future success! Why you should always pick the lifestyle you want first and then build your business around that – you may be very surprised at what you read here! How to access and market over 10,000 of the hottest selling, in-demand products in the marketplace – these products can make you hundreds of dollars in just a matter of days. How to find profitable niche markets – and explode your profits! 11 great business ideas –that are sure to get you started off on the right foot! How to find or create killer reports – follow these tips and you’ll soon have people lining up to buy your products! What type of business makes money online, and what businesses are doomed to failure … once you learn this vitally important information you will be well on your way to Internet success and the lifestyle you have always dreamed of! How to sell other people’s products and get paid a handsome commission, without handling any of the customer inquiries, product delivery and other profit-eating parts of the process … that’s right, I will tell you how to make money without spending any money! How to start an Internet business that is totally automated so that all your customers buy online and your bank account fills up with money even when you are on vacation … it will be just like owning your own 24-hour money printing machine! How to launch a successful Web presence that is guaranteed to help you begin making money instantly … I was once in your shoes, I know you want results fast and that’s exactly what I am going to tell you how to get! Where to find crucial tools that will help automate your business and eliminate the “normal” stressors that come as a result of starting your own business … follow my advice and you will be amazed at how easy it is to make money – lots and lots of money – online! Could A Marketing Expert With a Variety of Websites That Routinely Produce 5 Figures in Cash a Month Teach You Something About Becoming Financially Secure? And right now, I am searching for hungry, business-minded men and women with ordinary backgrounds who have yet to tap the potential of their abilities and achieve the exceptional results they’ve only dreamed were possible up until now because they’ve never had access to the advice and information they need to succeed! 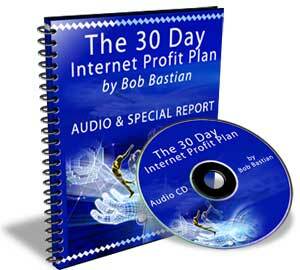 … then “The 30 Day Internet Profit Plan” is for you! “The 30 Day Internet Profit Plan” on audio so that you can listen and learn how to achieve the success you’ve always dreamed of whenever you have the time – such as while you are stuck in traffic, while you are exercising, while you are cleaning the house, etc. A complete transcript that you will refer to again and again for the practical advice and important money-making information. How to Learn Spanish with Amazing Speed and Accuracy! Only 12 days in your hectic schedule – that is all you need to allot in order to become an efficient Spanish speaker or conversationalist. You don’t believe it? First of all, I am aware of the fact that people’s lives are getting busier and busier every day. We are forced to fit tons of activities in a day. Sometimes there’s no time left for ourselves. Time is indeed essential to most of us. The fact that you’re canvassing Spanish books on the internet means you have no time to go to any bookstore or library to acquire one. You may want to do things in the least possible time, using the easiest and most effective ways, in order to make the most out of your busy schedules. Learning a foreign language can be a frightening thought for many. According to them, it will just take up a lot of their time. They often disregard the wonderful opportunities that knowledge of a second language brings. It can help you bond with people who speak the same foreign language as you do, create job opportunities and enhance your career, and impress your friends. Furthermore, engaging yourself in foreign language training actually adds self-confidence and broadens your knowledge. That is why I extend my congratulations to you, as you have decided to improve your personal, intellectual, and social being. Your decision to learn the Spanish language is another wise choice as it is among the most spoken languages in the world. You can never avoid dealing with a lot of its speakers sometime in your life. Therefore, it isn’t really enough that you know simple greetings like hi, how are you, and basic vocabularies in Spanish. Common foreign language training usually bombards you with thousands of words and phrases in their vocabulary and let you memorize them until you get used to speaking them out – without really knowing how they became that way. The most effective way to learn a foreign language is through the linguistic approach – training starts from sounds, from which words and phrases are formed until the eventual construction of sentences using these words is made. Sounds are among the fundamentals of one language because all throughout language training, these sounds are used to speak out words and form sentences. Words should be learned one at a time according to the word category they belong to (nouns, verbs, adjectives, etc. ), as they have characteristics unique to the category only. Sentences are actually a proper arrangement of words only. Hence, enough knowledge of words and their characteristics can create sensible sentences. Learning a new language involves being familiar with its greetings and most basic phrases, and actually knowing how they came to be. Linguistics, the study of the structure of a language, is an area of knowledge that is very important and effective; but is never really exposed to many. Yet you could be one of those few people to benefit from it! In this light, I have prepared a comprehensive report to help you learn how to speak the Spanish language using linguistics … in just 12 days or even less! With pronunciation guides, accurate glosses, and ample examples, you will never have any problem understanding each Spanish word and sentence you’ll be encountering until you’ll be able to create your own sentences as well. You don’t need one whole school year or even a semester to train yourself in a language that more than 250 million people speak. 12 days is all it takes to learn how to speak Spanish! Easy-to-apply memorization tips and tricks to remember Spanish words better. How each of the letters in the Spanish alphabet is called, how each one of them is pronounced, and some examples for practice. Sounds not present or are very minimal in the English language but are common in Spanish. Creative techniques to recall various Spanish words. A 4-day training session to easily tackle the most complicated topics in Spanish. How to form and structure different kinds of basic Spanish phrases and sentences. The first step in learning a new language. How to pronounce different Spanish words correctly. Easy and simple ways of creating grammatical and sensible Spanish sentences. Basic greetings and everyday expressions in Spanish. How to identify formal and familiar situations in order to use the appropriate expressions. The difference between describing with Spanish and English adjectives. Spanish adjective classifications according to common descriptions they provide. The importance of studying individual word forms before constructing sentences. Numbers, days, months, time, etc. in Spanish. List of Spanish prepositions and example phrases. How Spanish nouns form their plural counterparts. How regular Spanish verbs form past, present and future tenses. What the irregular verbs are and how they form their tenses. How to create the present progressive form (I am eating, you are singing, etc.) in Spanish. 2 ways of forming the future tense of Spanish verbs. Why the subject of the sentence is optional and usually omitted in Spanish. The truth that verb alone is already a complete sentence in Spanish. What conjugation is and how it is done in Spanish. What the 3 groups of Spanish verbs are. How to form Spanish interrogative statements. How to form Spanish imperative statements. Understanding airport, road, train, market and other signs written in Spanish. What to say when ordering food, shopping, hiring public vehicles, checking in at hotels, and in other usual situations using the Spanish language. And a lot, lot more! You have bought the PLR (edit the .doc files as you please) and MRR License so you can Master Resell this product.